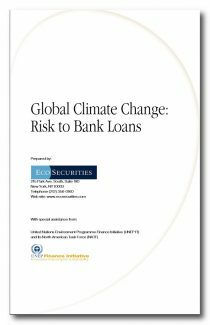 “Global Climate Change: Risk to Bank Loans”, the latest publication from UNEP FI’s North American Taskforce, assesses whether climate change poses a risk to the loan portfolios of banks in Canada and the US. The report, prepared by EcoSecurities, seeks to better understand the macro impact of climate change on financial risk, and the specific debt sectors most impacted. The report also reviews strategies that can be used by companies and banks alike to reduce the impact of climate change on their businesses, and culminates in recommendations for banks and regulators stemming from the report’s risk analysis of each loan sector in the US and Canada.